Tiny Kong in her Mini-Monkey form. 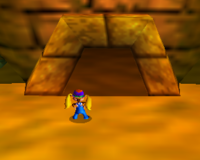 Mini-Monkey (Kongum Smallus) is an ability learned by Tiny Kong in the game Donkey Kong 64. After purchasing one of Cranky Kong's potions, Tiny will be granted with the ability to turn small, which she can use by jumping into one of Cranky's Kong Barrels with her face on it. This makes the ability unique, as Mini Mario cannot be done at will, and requires an item such as a Mini Mushroom to work. Tiny Kong's small size is shown to be useful, allowing her to access some areas that usually cannot be accessed. If the Saxophone Slam is used on a Music Pad in certain areas while this ability is in effect, Squawks will arrive and carry Tiny into higher areas she would normally be unable to reach. ↑ Donkey Kong 64 instruction booklet, page 17. This page was last edited on August 24, 2018, at 23:41.